Today, we have a wonderful recipe for you from the cooking blogger “Le Pétrin” ! Thank you Sandra! 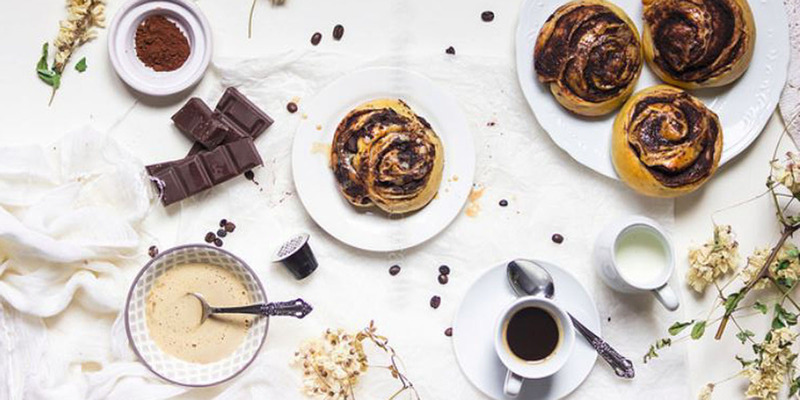 Since ﻿she has already created numerous recipes to go with our coffee, she had to brainstorm a little before coming up with an excellent idea – Chocolate Coffee Rolls with Cream Coffee Icing! Read her article here! 1. Prepare 2 espresso coffees (2 x 45g) and leave to cool. Keep the used capsules. 2. In a large bowl, mix together the flour, salt, sugar brown sugar and vanilla sugar. Dig a well, then add the crumbled fresh yeast, milk, coffee and eggs. 3. Mix from the center going to the edges to incorporate all the flour, until you obtain a homogeneous paste. Knead for about 5 minutes to develop the gluten and give strength to the dough (add a little flour little by little if the dough is too sticky). 4. When the dough is smooth and homogeneous, add the butter in small pieces (in 5 or 6 times) until each one is incorporated into the dough before adding the next one. 5. Once all the butter is incorporated, continue kneading vigorously for about ten minutes- the dough will become more and more flexible and elastic. 6. When it is smooth, satiny and slightly sticky to the touch, form a ball and put in a bowl. 7. Cover with a clean kitchen towel and let rest for 1 hour (the dough should have risen but not doubled in volume). 8. Make a flap and place the dough in the fridge (4 ° C) well covered for 1 hour (the dough can stay a few hours or overnight). 1. Prepare an espresso, let cool and keep the capsule. 2. In a bowl, work the butter with a wooden spoon until you get an oily texture. 3. Add all of the sugar and mix vigorously to form a light creamy mixture. Add the cream, the coffee powder, and the cocoa; then pour the coffee little by little to dissolve the powders and form a spreadable paste. Set aside. 4. Coarsely chop the dark chocolate and set aside. 1. Top with 15 tartlet molds, 2 round baking trays or 20 cm squares or 2 baking trays with parchment paper. 2. Transfer the dough to the floured work surface, crushing it gently with the palms of the hands to partially degas it. 3. Layer of dough in roller so as to form a rectangle 3 times longer than wide. 4. Spread half the dough on 2/3 of the length of the rectangle. Make a simple turn in the wallet: fold the “bare” end of the dough on the center of the long rectangle then bring the other end over. 5. Turn the dough a quarter turn and spread again to form a rectangle of about 35cm x 45cm. 6. Spread the rest of the filling (leave the bottom of the rectangle bare for about 1cm) then spread the chopped chocolate by pressing slightly to make it adhere. 7. Roll the dough, squeezing as far as possible towards the bare edge of the dough. 8. Pinch at the seam to “close” the roll, place the seam underneath and roll the dough a little to make sure it is even (if the roll of dough becomes too soft, place it for a few minutes in the freezer for strengthen). 9. Cut 15 pieces of 3 cm and place them as you go in the prepared cut-face molds (space the pieces when using a dish or a dish). 10. Cover with a clean cloth and let rise for 45 minutes to 1 hour. 1. Preheat the oven to 190 ° C. Brush rolls with beaten whole egg and bake rack in the center. 2. Bake for about 12 to 15 minutes: the rolls should be golden brown. 3. Transfer to a rack and let cool. 1. Pour the icing sugar into a bowl, add the coffee, cream and coffee powder from the capsule used for the filling and mix to obtain a fluid but fairly thick glaze. 2. Spread the icing at will on the rolls and enjoy!